Here’s a site you’ll want to be familiar with: ewg.org. That stands for Environmental Working Group, which is a consumer education and advocacy organization. And importantly, they have invested heavily to create databases for checking on toxicity. Guide to clean (and pesticide-dirty) produce. Guide to toxins in cleaning products. Guide to toxins in cosmetics and personal care products. I’m particularly excited about the guide to household cleaners because…well, I’m not a scientist. I had no previous way of knowing whether my goods were what they claimed. And guess what? Some of my “green” labeled products came up with FAILING ratings. What? Yeah. Charlie’s Soap products, which were sitting in my cabinet when I found the database and began searching. Not all the databases are perfect (being updated often, but not perfect), and of course some of the opinions are subject to your health philosophy (like saturated fat in raw organic cheese being flagged as unhealthful; you probably know I’m a butter-fat advocate, in moderation). But if you’ve been frustrated by the lack of ingredients on your cleaning products, or the lack of your own knowledge on how to interpret the ingredients which are listed on your personal care products, these sites are for you! Oh, there are some Apps too…check your app store for EWG. The privately created ThinkDirty app is nifty too…barcode scans your personal care items! Have you used any of these databases? Have you had ingredient revelations? 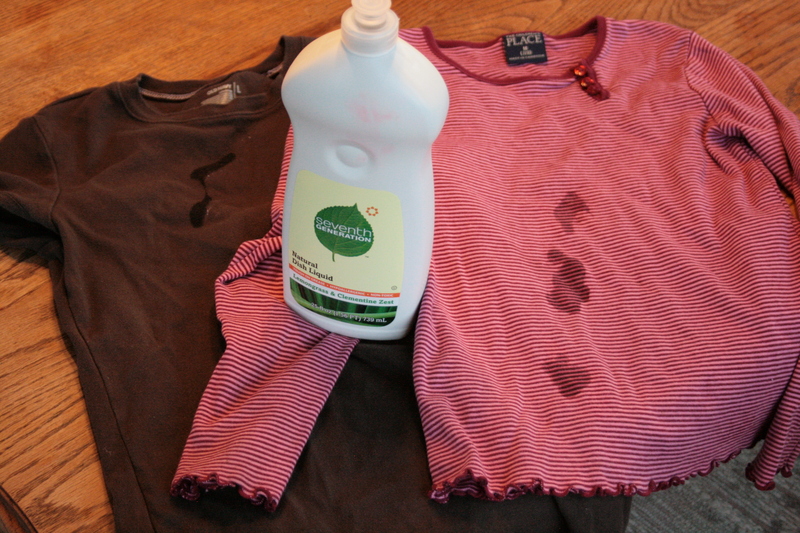 Here’s my favorite trick for removing oil stains from clothing: dish liquid. Just rub a small amount into the stained areas, either right before washing or as soon as the item goes into the laundry bin. Wash as normal, in a load with other clothing and soap. This usually takes out oil stains in one washing.